Oak Park, Illinois is a quiet suburb of Chicago most noted for two things: 1. Frank Lloyd Wright, architect and Tavi Gevinson, teen fashion blogger. In 2010, she was a preteen when my friend Julia pointed her out to me one day standing on the sidewalk as we were driving around in her minivan. 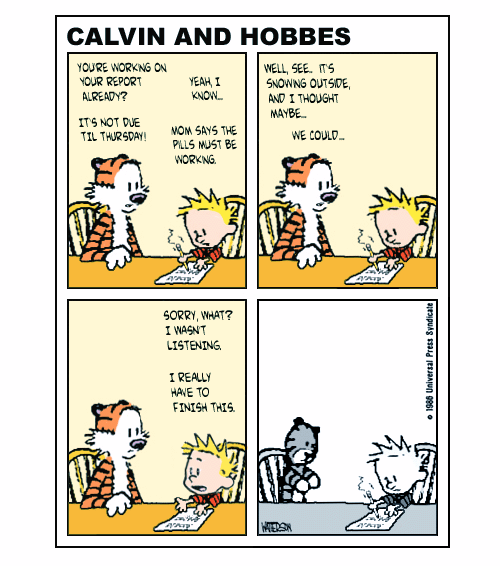 Bill Watterson, creator of this strip, is a genius as far as I’m concerned. Thinking of clever, witty things to draw is a challenge in and of itself. After living in terribly warm places, living in snow territory was a treat to me so I was out a lot in it. The sidewalk and walkway in front of The Freehouse were kept clinically clean thanks to my snowbunny enthusiasm. Plus, I did not know many people way out in Oak Park and was often seeking additional entertaining urban activities outside anyways. It was also a method of training myself to get used to cold weather, so when I moved back to Holland eventually it would seem less cold and wet. It worked. The Freehouse had already been vacated by my friend and her family, which is a whole other excluded sidebar today. The neighbors immediately next door had kids and were perhaps slightly less enthused about a “murder scene” in the backyard but WHO CARES. Yolo. They all benefited with snow-free sideways too, when I was feeling generous. 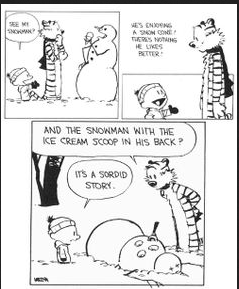 The online album had an annoying popup ad so here is a pdf version of the Calvin & Hobbes Snowmen Gallery from Angelfire. 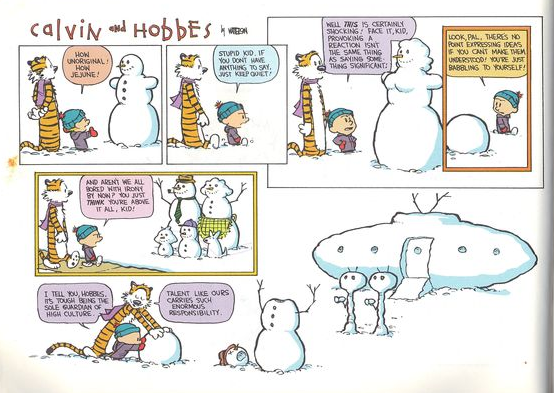 Calvin & Hobbes is by far one of the most hilarious and endearing comics of my youth. Long live Calvin. Answer to: What ever happened to Bill Watterson?